Trim woody stem off sprouts and split in half. 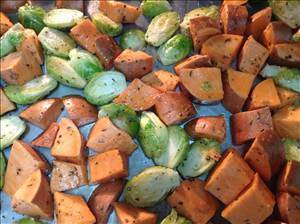 Scrub sweet potatoes and cut into chunks about the size of your brussels sprouts. Rinse and thoroughly drain vegetables. Add all ingredients to a very large bowl and toss or stir to coat. Pour vegetable mixture onto 15"x20" baking sheet (foil lined or sprayed with nonstick aerosol). Arrange into a single layer. Roast vegetables until tender and caramelized, about 30 minutes. Give the vegetables a stir on the baking pan halfway through cooking. Note: you can sub 'pure' maple syrup for agave. There are 226 calories in 1 serving of Roasted Brussels Sprouts & Sweet Potatoes. Calorie break-down: 32% fat, 58% carbs, 10% protein.